This new edition of Aristotle's Nicomachean Ethics is an accurate, readable and accessible translation of one of the world's greatest ethical works. 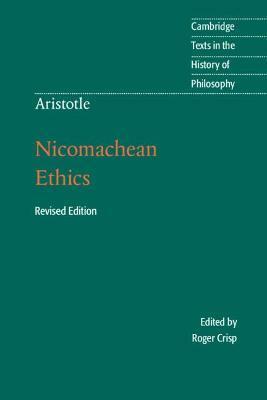 Based on lectures Aristotle gave in Athens in the fourth century BCE, Nicomachean Ethics is one of the most significant works in moral philosophy, and has profoundly influenced the whole course of subsequent philosophical endeavour. It offers seminal, practically oriented discussions of many central ethical issues, including the role of luck in human well-being, moral education, responsibility, courage, justice, moral weakness, friendship and pleasure, with an emphasis on the exercise of virtue as the key to human happiness. This second edition offers an updated editor's introduction and suggestions for further reading, and incorporates the line numbers as well as the page numbers of the Greek text. With its emphasis on accuracy and readability, it will enable readers without Greek to come as close as possible to Aristotle's work. Introduction; Chronology; Further reading; Note on the text; Nicomachean Ethics; Book I; Book II; Book III; Book IV; Book V; Book VI; Book VII; Book VIII; Book IX; Book X; Glossary; Index. "A teacher looking for a single translation of the Nicomachean Ethics to use as a textbook, and a general reader who wishes to rely on a single translation of this work, will do well to choose Crisp." Roger Crisp is Uehiro Fellow and Tutor in Philosophy at St Anne's College, Oxford and Professor of Moral Philosophy at the University of Oxford. He edited the Oxford Handbook of the History of Ethics (2013), and is author of Reasons and the Good (2006) and several articles on ethics, including one for The Cambridge Companion to Utilitarianism (Cambridge, 2014).